Utah artist Brad Teare uses black and white acrylic markers to simulate the look of comic pages or wood engravings on large gallery canvases. 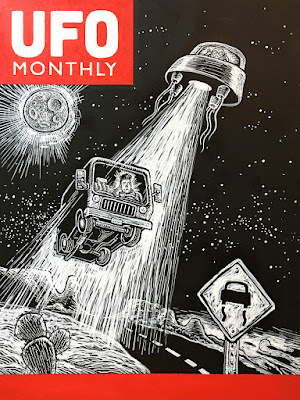 Brad started out doing underground comics and relief printing, then painted landscapes and abstracts. 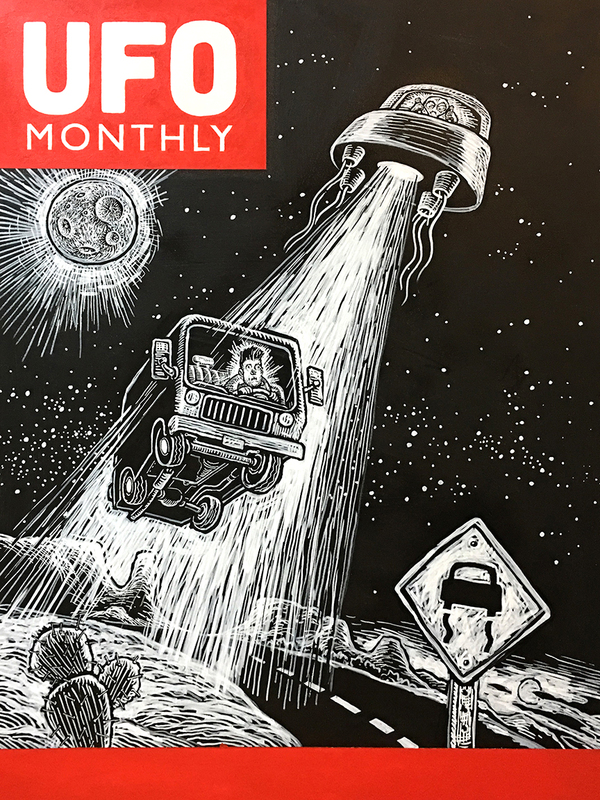 His development of this new technique brings together his love of science fiction and comic imagery with his gallery work. 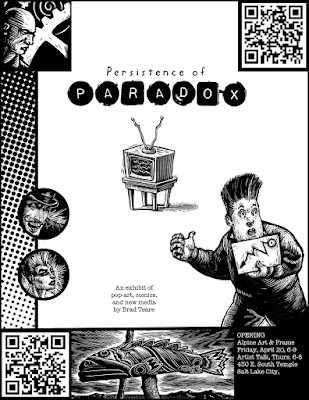 Brad is prepping for a gallery show called "Persistence of Paradox" that will open April 20 in Salt Lake City. 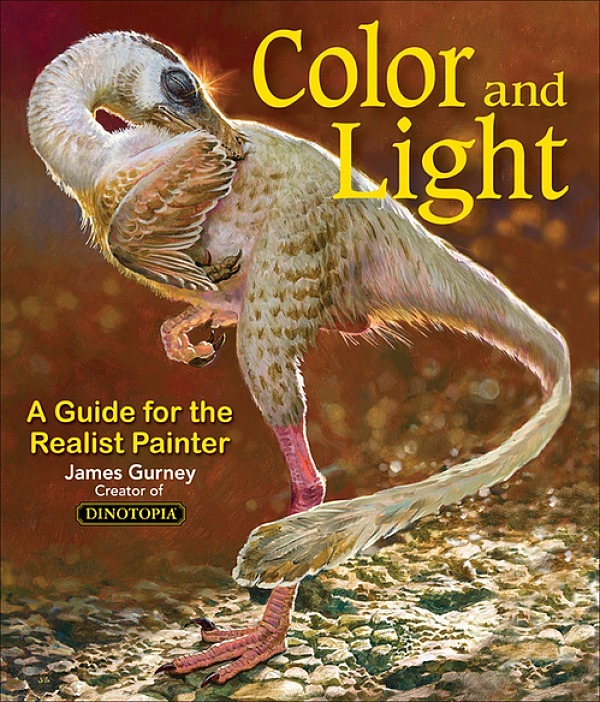 James Gurney: What led you to discover the acrylic markers that you have used in your recent paintings? 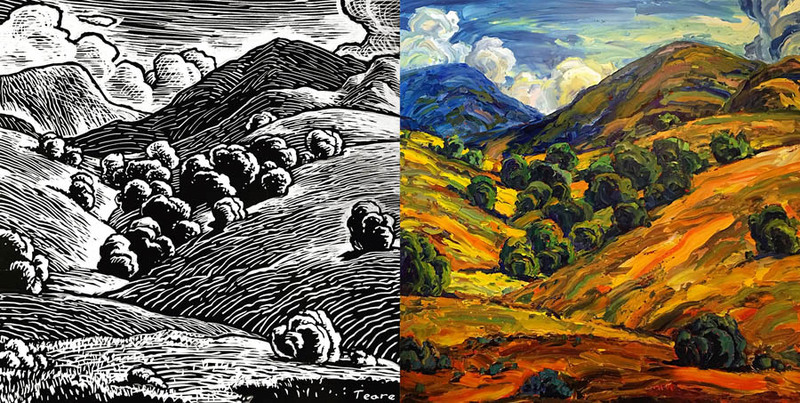 Brad Teare: I attempted for years to express the dynamism of woodcut on canvas with a variety of techniques. I even tried scraping into wet black paint on a sealed canvas, in imitation of scratchboard, but with little success. Last October I attended the Adobe MAX conference in Las Vegas where the organizers mounted black mylar on the walls of the main lobby. They provided markers and invited people to draw graffiti. The black surface reminded me of the basic premise of scratchboard–starting with black and adding light. I grabbed a white marker and began sketching. As anticipated the experience was nearly identical to scratchboard. When I got back to the studio, I painted a canvas black, grabbed a white marker, and executed my first marker painting on canvas. What have you learned about the various brands and types of these markers? I usually buy empty markers, the Montana Acrylic Marker or Molotow brands, and fill them with Golden High Flow Acrylics in Titanium White and Carbon Black . My favorite marker is the 15 mm square tip from Molotow, but it's good to have a variety of tips for different thicknesses. The thick, square tip has several edges that make a variety of marks, just like you might use a thick bristle brush to get a variety of smaller strokes. I start with a thick tip and work my way toward a thinner tip as I refine detail. Sometimes, regardless of how many layers of white I add, it can be challenging to get an adequately opaque layer of white. I attribute this to the white separating faster than the black pigment, or to the absorbancy of the canvas. To diminish absorbancy, I occasionally spray Krylon Gloss Acrylic onto the surface. In very broad areas of white, I might paint on Titanium White with a brush. I keep the texture as flat as possible in case I need to restate the blacks. If someone is curious about them, what should they buy to get started? Any brands to avoid? Get markers with a wide variety of tip sizes. Some tips will work better on different surfaces. For example, the white 1 mm tip on canvas can give a broken, splattered line if held incorrectly. But the size is perfect for fine detail on a smooth surface. I always use markers that can be refilled since I cover a lot of canvas with my large paintings and need to refill on a regular basis. The only marker I've had trouble with is the 30 mm Montana marker . I loaded it with straight Golden High Flow Titanium White and it leaked quite a bit. I increased the viscosity by adding some Golden Fluid acrylic and got it to work. What's the difference between the Golden Fluid and High Flow acrylic when it comes to filling the markers? I recommend using Golden High Flow Acrylics, especially with Titanium White because it's opaque yet highly liquid. The Golden Fluid Acrylic has a thicker viscosity and will cause problems with flow if used straight. But it can be used to add thickness (the paint can thin from not shaking the pens while in use and using up the thicker part leaves a watery remainder). I usually keep a pen in my non-drawing hand so I can shake it and trade back and forth ensuring I use the thickest paint. What's your basic procedure with the black and white markers? My favorite method is to paint a commercially prepared, fine weave canvas with solid black acrylic. I then begin to draw with a 15 mm white marker, using the edge for thinner marks. Often I don't even have a preliminary drawing but just dive right into the composition. I use my black markers as erasers to return the canvas to its original black coating. I let the black acrylic dry and then restate the correction with white markers. It is an incredibly fluid and spontaneous method. 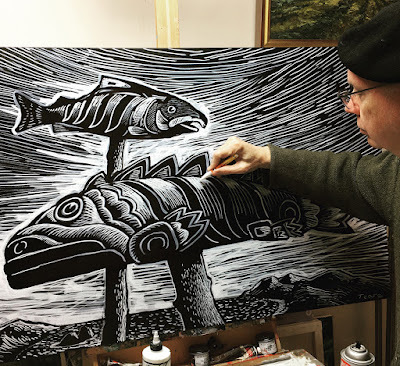 Does your background in woodcuts and scratchboard influence the way you approach this technique? 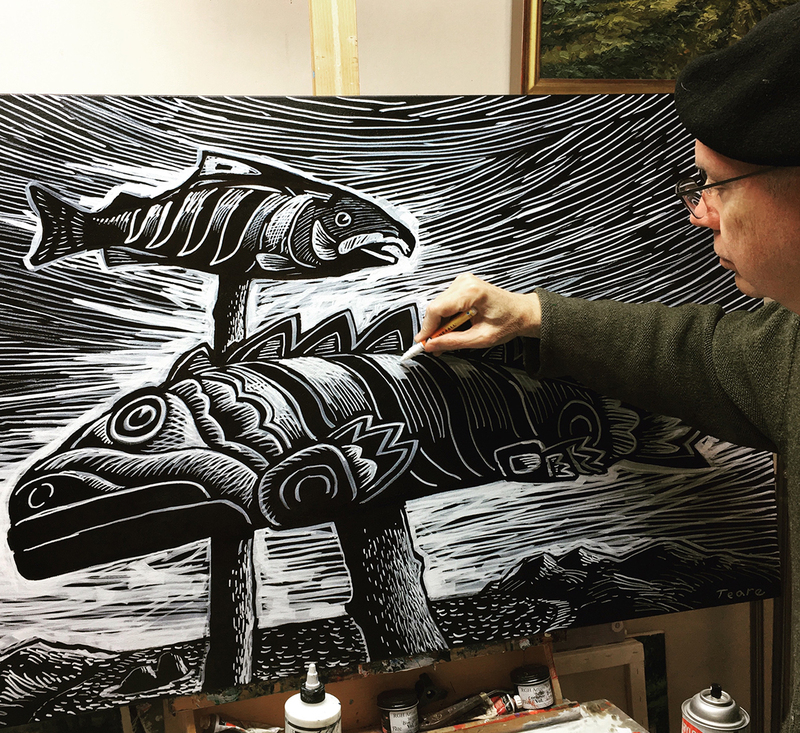 The technique I use with markers is the same I use with wood engraving. A technique called white line engraving entails outlining form in white on a black ground. Eric Gill often used that method, as did Lynd Ward. It suggests that forms are being illuminated by rim lighting. I establish my basic composition with white lines which when printed would look like a negative of a pen and ink drawing. I then add the lightest areas by clearing out those areas, which would print as white. This gives a strong black and white structure. 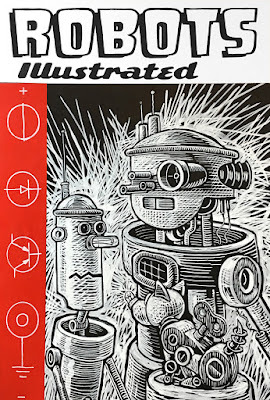 I then add the grays with additional crosshatching. Grays are suggested by modulating the frequency of the lines and the thickness of those lines. 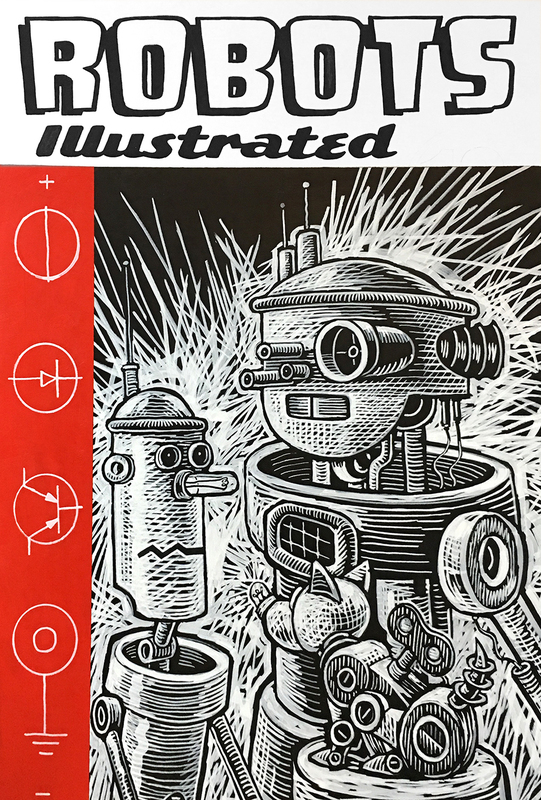 A rule of thumb in wood engraving is that one cut makes a white line, two cuts make a black line, and three or more cuts make a gray tone. I use the same precepts with my marker paintings. What are your thoughts about the aesthetics of black and white on a large scale? How is the effect different from on a comics page? 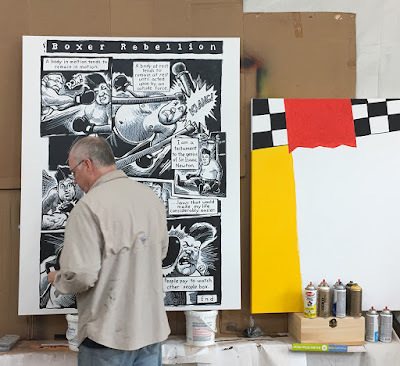 When I upscaled several comic pages onto 60" x 48" canvases, I was amazed at the increased impact. Some images can have a gem-like charm on a smaller scale, some beg to be large. The explosive strokes of the scratchboard translated well into a large scale and had even more energy. Your Cypher comic was one of my favorite underground comics. 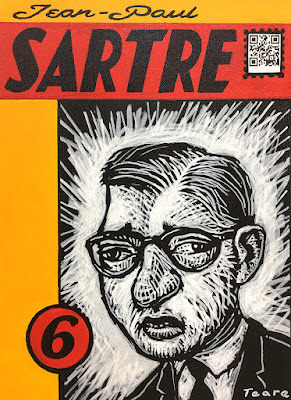 Portraying that character and his philosophy in the gallery world is a real departure from the thick-paint semi-abstract landscapes you've been doing. Does this represent a challenge for your dealer or any of your fans? Does it attract a different constituency? The Persistence of Paradox show will undoubtedly attract a different type of art collector. But my galleries have been surprisingly patient with my diverse artistic projects. They understand that, like my abstract phase, these projects are profoundly transformative. My landscape gallery and the gallery exhibiting this show are only two blocks away. Their primary concern is my success. I feel fortunate to have such amazing galleries. 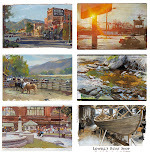 You've created some videos with a low-fi analog vibe to promote these paintings (Link to video). How do you produce them, and what's your thinking about the aesthetics of the production design? I had some videos online that related to Cypher , and I thought it would be fun to add QR codes to the actual art so gallery attendees could access the animated imagery on their phones. It seemed to magnify a facet of the Cypher Universe, so I decided to create more imagery specifically for the show. I opted for the lo-fi look because of the grunge aesthetic of the original Cypher project as well as its nostalgic tone. I also liked the idea that with the lo-fi look it's as if you're looking through a veil, with something of greater importance just beyond your grasp. It seemed a good metaphor for the project. I edit the raw footage in iMovie, process with the app filters 8mm and Vintage, then add a voiceover in iMovie if it needs narration. What are your recommendations for young artists who have a few radically different styles of artwork? Believe in your artistic vision. How and why you create are the distinguishing factors in evolving a unique expression. The personal qualities of the how and the why will eventually fuse into something truly distinctive. I've always known I had two wildly diverse artistic impulses that I hoped would one day coalesce into a unique style. There are never any guarantees, and art is a high stakes proposition, but I'm grateful that after twenty years of experimentation I'm finally on the verge of a synthesis. You have to have faith that your multiple styles will ultimately magnify one another. What kinds of imagery will you be exploring next? I've learned so much from the Persistence of Paradox project. It's a good lesson that you have to follow the muse despite the costs. 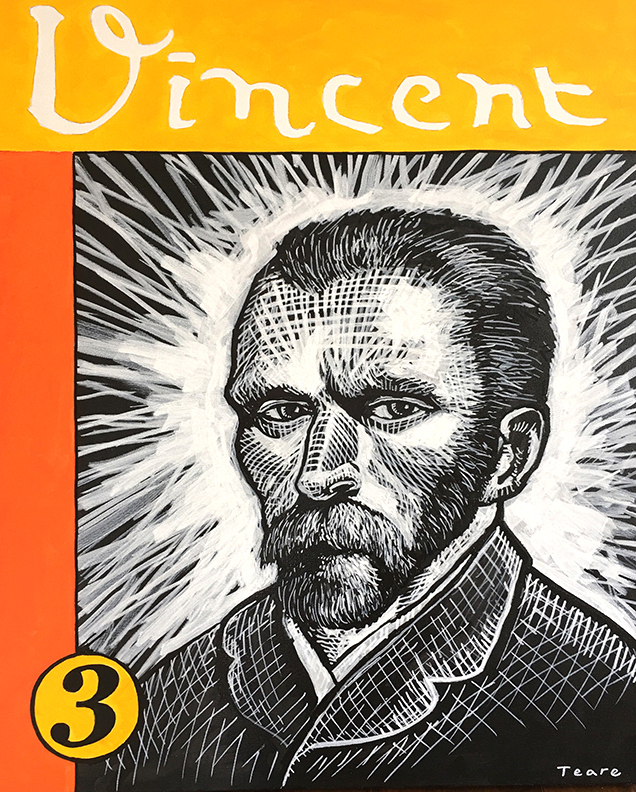 As mentioned I've been trying to synthesize the more intellectual aspects of wood engraving and woodcut with the more spontaneous, emotional elements of a very loose style of impressionism. I've experimented previously with using marker paintings as an underpainting with my landscapes but viewed it as lost effort. I now see that such drawings are not only a kind of rehearsal for painting, but a subterranean infrastructure onto which I suspend the energetic strokes of multi-hued color. 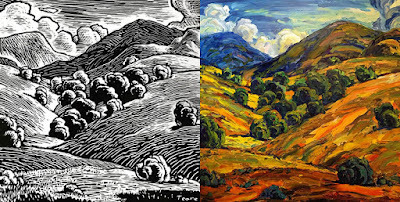 My next project is to fully synthesize the world of marker painting with my impressionist landscapes. So darn rad. This art-icle brightens my morning. I did a Seurat-style piece using Sharpie Oil Paint Markers after seeing they were rated permanent. But further research showed that doesn't mean archival at all. A two day exposure test in bright sunlight here in Hawaii didn't seem to fade my sample piece, but looking at it again I think the yellows faded some. 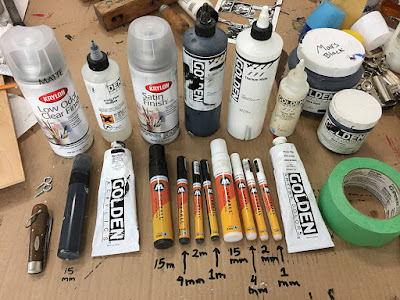 Then a couple days ago our wonderful Akamai Art Supply had a bunch of art reps demoing their wares and I discovered the Molotow markers mentioned in this post. They are rated archival, so I'm looking forward to trying them out. The markers seem to have a very modular design for refills, dual nibs, and a very opaque white. I'm hoping the colors are more intense with a wider value range.